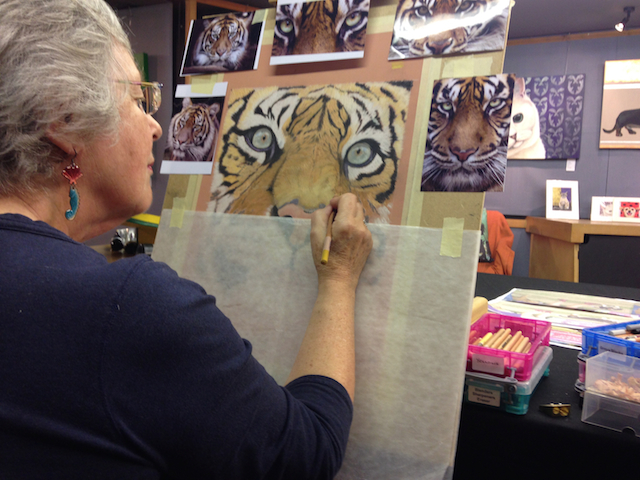 Judith is a pastel artist and conservationist. She enjoys combining her two passions with an increasing focus on painting endangered animals, and supporting a number of wildlife charities through her work. Judith draws on a wealth of personal experiences with nature in both the UK and Africa, using her own field sketches and photographs as reference material. Recent works have included, Sumatran Tigers, African Elephants, Cheetahs, Rhino, Mountain Gorillas, Otters, Scottish Wildcats, and Badgers. Judith has had her work exhibited globally and was a Finalist in the 2016 David Shepherd Wildlife Artist of the Year Exhibition at the Mall Galleries in London. She is also a finalist in the Wildlife Competition run by International Artist Magazine and is featured in their June/July 2017 issue.